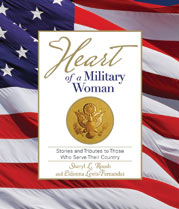 Heart of a Military Woman is a keepsake collection of true short stories, touching tributes and emotive poems, celebrating our active and retired service members. Historic, nostalgic and some quite recent, these are written by military members, their families and loved ones, sharing sentiments and pride as only they can. These are real stories, from real people, about real life. She is a tough and formidable opponent... Yet her heart will soften and swell with pride as she looks at Old Glory or the men and women and children she serves and protects... Her heart aches for home and her loved ones, especially when she is far away... She is amazing in her ability to adapt, overcome adversity, do whatever it takes and still dance the night away if given a pair of heels, a dress and music. She laughs deeper, loves harder and her heart knows no bounds. That is the heart of a military woman. Best Spiritual / Inspirational book for 2009 from the San Diego Book Association Awards.